The Culmination of Years of Geological Work at Thor ! The Thor deposit is dominated by a very large volcanic/hydrothermal system that measures at least 2 km by 1 km in size, and probably much larger. Precious-base metal deposits are confined to a single stratigraphic contact that is a time equivalent of the Jowett Formation (Carboniferous in age) and are associated with the edges of the volcanic pile. The mineralized horizons have been isoclinally folded along the edges of the volcanic pile, and high-grade gold deposits such as the SIF Zone and Gold Pit are found along these distant peripheries of the main Ag-Au-Pb-Zn-Cu deposit. These observations are consistent with the interpretation that Thor and many of the other deposits in this largely unexplored belt are felsic-siliciclastic volcanogenic massive sulphide deposits. 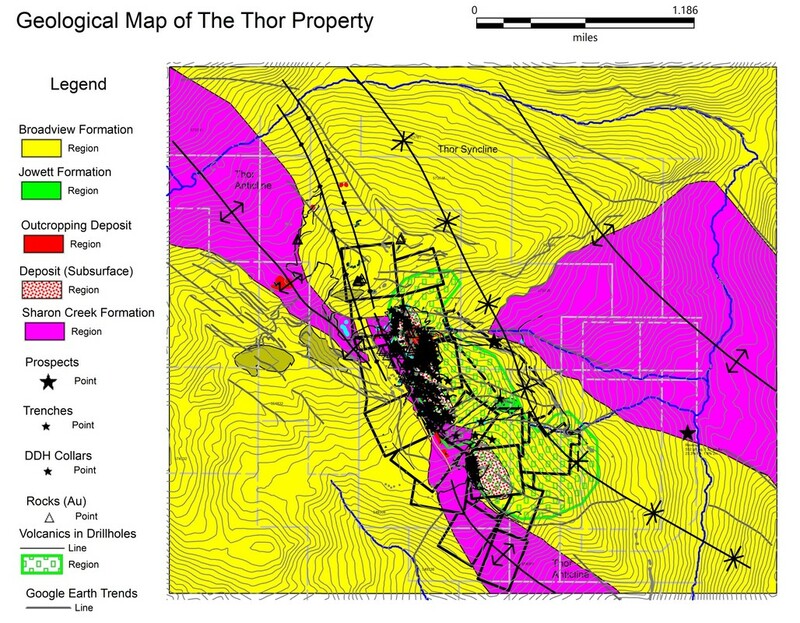 The recent study identified other targets on the main Thor property that have seen no drilling. The following table contrasts the size of these targets with the known deposit, and serves as an objective measure of the exploration potential at Thor.